Should You Continue Driving If Your Temperature Warning Light is On? as towing a heavy trailer during hot weather may overload the cooling system's capacity to control heat, but usually, a temperature warning light means trouble. STOP DRIVING IMMEDIATELY!. Pull over to the side of the road as soon as it is safe to do so, then shut off your engine and wait for things to cool down. WARNING: Do NOT attempt to open the radiator cap! The radiator contains hot water under high pressure. Opening the cap on the radiator or a pressurized coolant reservoir could allow steam and water to blow out and burn you. There's nothing to be accomplished by opening the cap while the engine is still hot, so let your vehicle sit and cool off. After things have cooled down (wait at least half an hour or more), then you can open the radiator cap or reservoir and check the coolant level. Place a rag over the cap first, and slowly turn the cap until it stops at the first detent. This should allow residual pressure to be released. Wait until all pressure has been released before removing the cap the rest of the way. Add water or coolant to the radiator or coolant reservoir if it is low. Actually, you should add premixed coolant or a 50/50 mixture of antifreeze and water to maintain the proper freezing, boil over and corrosion protection. But in most cases when this happens, it's an emergency situation and you won't have a jug of antifreeze handy. If that's the case, add water now, then drain out some of the coolant later and offset the extra water by adding the proper amount of antifreeze. Your engine may have overheated because of a coolant leak. Visually inspect the radiator, engine and cooling system for leaks. Common leak points include radiator and heater hoses, hose connections, the water pump and radiator. Internal leaks (such as a crack in the head or engine) can't be seen and can only be diagnosed by pressure testing the cooling system. 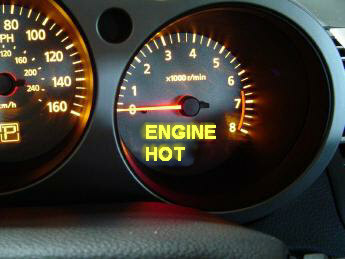 If you keep driving an engine that is overheating, it can cause serious damage. The engine may start to knock (caused by detonation), which in turn can cause piston, ring, and head gasket damage. As the internal parts of the engine expand from the excessive heat, clearances may be reduced to the point where metal-to-metal contact occurs. Valve stems may gall and stick, and the pistons and camshaft might scuff or seize. Severe engine overheating also creates tremendous thermal stress in the head(s) and block. This, in turn, may lead to cracking and/or warpage. This is a common problem with overhead cam engines that have aluminum heads. The only vehicle that can be "safely" driven when the temperature warning light is on a late model Cadillac with a Northstar V8 engine. Cadillac engineers designed the engine control system to automatically deactivate half of the engine's cylinders if it senses an overheating problem. This reduces the heat (and power) being generated by the engine, and it allows the "dead" cylinders to pump air through the engine for internal cooling. The system is designed to provide a "limp-in" mode so the vehicle can be driven to the nearest service facility or Cadillac dealer for repairs. It is not designed for continuous driving.